With a story as epic and revered as Hamlet, a theatre company has to either go big or go home. And with its first-ever production of William Shakespeare's iconic tragedy (running October 11 through November 5), The Repertory Theatre of St. Louis is most definitely going big with an all-star cast and production team. That starts with acclaimed director Paul Mason Barnes, whose Rep adaptations of A Midsummer Night's Dream (2014), The Comedy of Errors (2012) and Macbeth (2011) brought fresh wonder to some of Shakespeare's greatest stories. 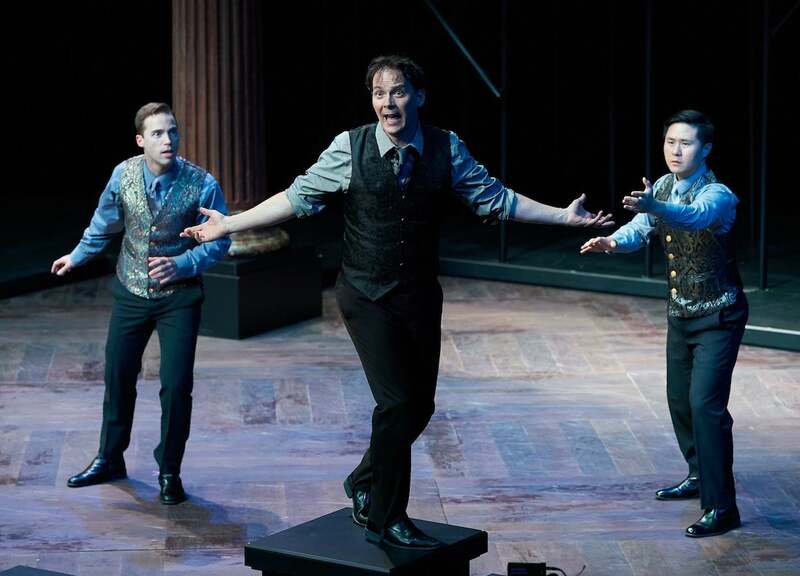 Midsummer and Comedy of Errors won a combined eight St. Louis Theater Circle Awards, including two for Barnes' direction. The show's cast is headlined by Jim Poulos as Hamlet, who previously starred in Rep productions of Amadeus (in the title role), A Midsummer Night's Dream (Puck) and The Comedy of Errors (Angelo) – all directed by Barnes. The supporting cast features an exciting mix of returning Rep favorites and newcomers: Michael James Reed (Claudius, his 13th Rep production), Robynn Rodriguez (Gertrude, her Rep debut), Christopher Gerson (Horatio, his third Rep production), Kim Wong (Ophelia, her Rep debut), Carl Howell (Laertes, his second Rep production) and Larry Paulsen (Polonius, his second Rep production). Other familiar names in the 23-member cast include Ben Nordstrom (Osric), Jerry Vogel (Bernardo/Priest) and Jonathan Gillard Daly (Courtier/Player King/Gravedigger). McCorkle Casting, Ltd. is The Rep's casting director. See the full cast list here. The design team behind the show is similarly stacked, starting with longtime Rep scenic designer Michael Ganio (All My Sons, 2017) and costume designer Dorothy Marshall Englis (A Christmas Carol, 2016). Lighting designer Lonnie Rafael Alcaraz (Midsummer and Comedy of Errors) and sound designer Barry G. Funderburg (Midsummer) continue their frequent collaboration with Barnes. Fight director Paul Dennhardt rounds out the production team, bringing an extensive history of fight choreography and instruction that includes productions at Shakespeare Festival St. Louis. Tickets to The Rep's production of Hamlet are currently on sale, and can be purchased online, by calling the Box Office at 314-968-4925 or visiting the Loretto-Hilton Center at 130 Edgar Road (on the campus of Webster University) from 10:30 a.m. to 5 p.m. Monday through Friday. Ticket costs range from $18.50 to $89. The Rep's production of Hamlet is sponsored by Wells Fargo Advisors, St. Louis Public Radio and Shakespeare in American Communities, a program of the National Endowment for the Arts in partnership with Arts Midwest.